Are you looking for a green gazpacho soup recipe (that doesn’t include avocados)? Keep reading – I have a great recipe for you below! Every new year, instead of setting resolutions, I like to set goals. I prefer goals to resolutions because I can make them measurable. For instance, instead of setting a resolution to be “healthier” this year (which is great, but not quantifiable), I set a goal to log my the food I eat daily and strive to hit my daily recommended value of fiber and essential nutrients. So this year, I am logging my food intake (there are so many free apps that make this super easy). I think just by making the daily decision to pay attention to what I eat, I am naturally incorporating a variety of nutrient-rich foods into my daily diet. 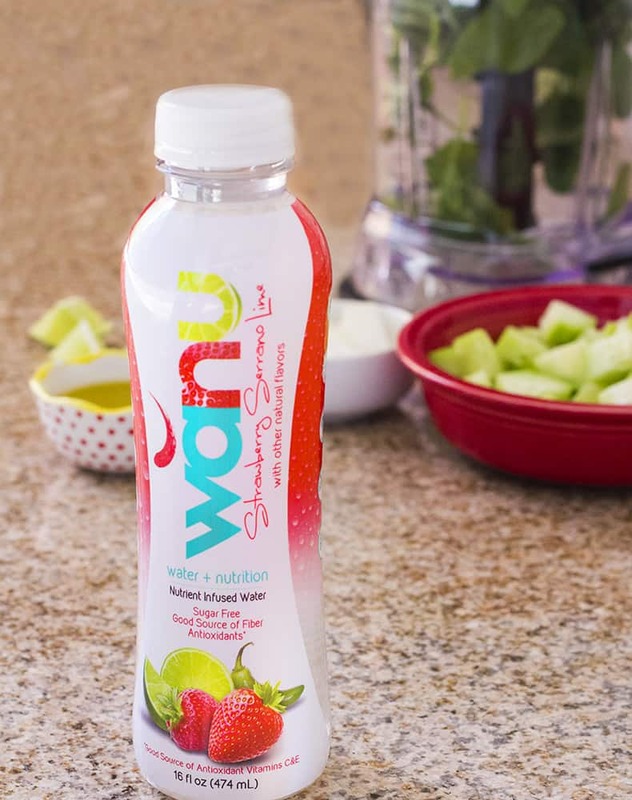 While I was grocery shopping at Albertsons a few weeks ago, I found a new product I was excited to try – wanu water. wanu water is a drink that includes all of your essential nutrients (think B1, B3, B5, B6, B12, K, Folic Acid, Biotin, Fiber and Vitamin E). The inclusion of all of the B vitamins provides you with natural energy, while the fiber helps you feel full longer which can help you achieve a healthy weight. 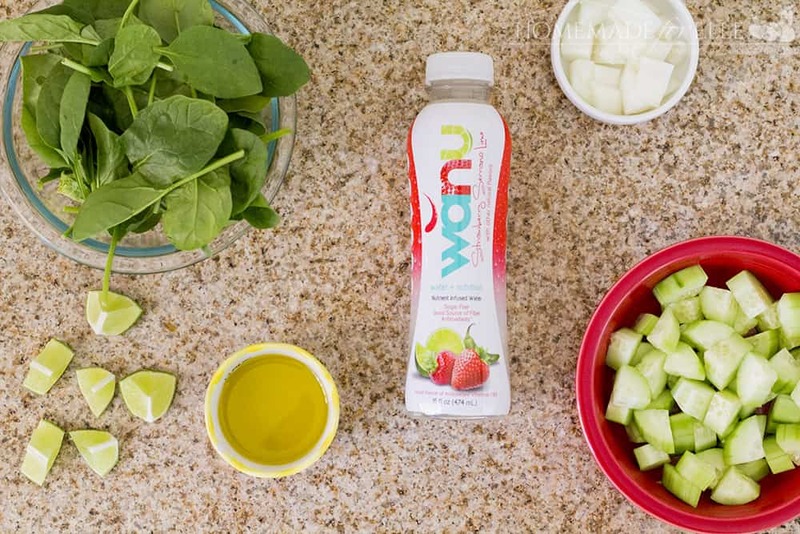 wanu water is naturally sweetened by monk fruit, which gives you the sweetness you crave, without the harmful effects of sugar or sugar substitutes. Since I discovered wanu water, my whole family has been drinking it. 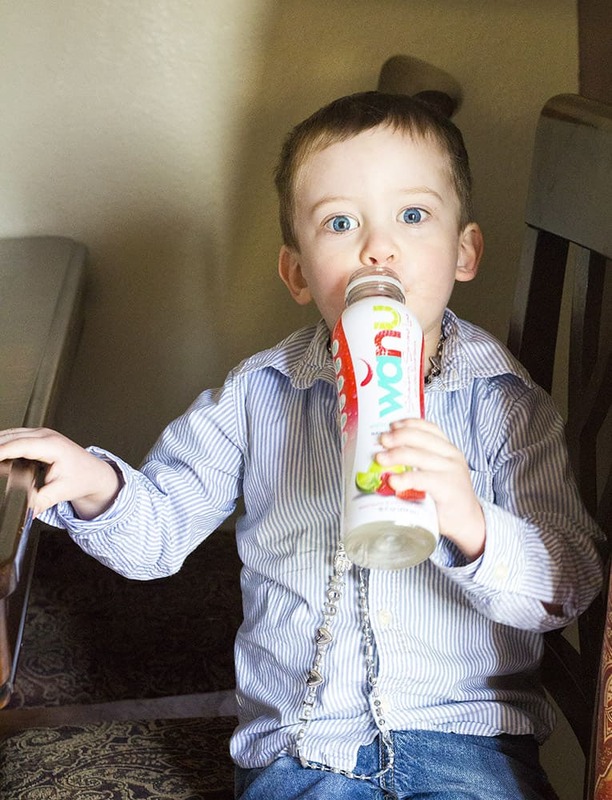 My kids love the sweet taste of wanu water, and I love that my picky eaters are getting some fiber in their diet. I’ve also been experimenting with adding wanu water to recipes to boost the nutrients of the dish. This week has been unseasonably warm, so I decided to create a green gazpacho soup recipe. This soup tastes like a summer day: fresh, slightly sweet, and earthy. It’s packed with a ton of essential nutrients, so you can feel good about enjoying each and every bite! 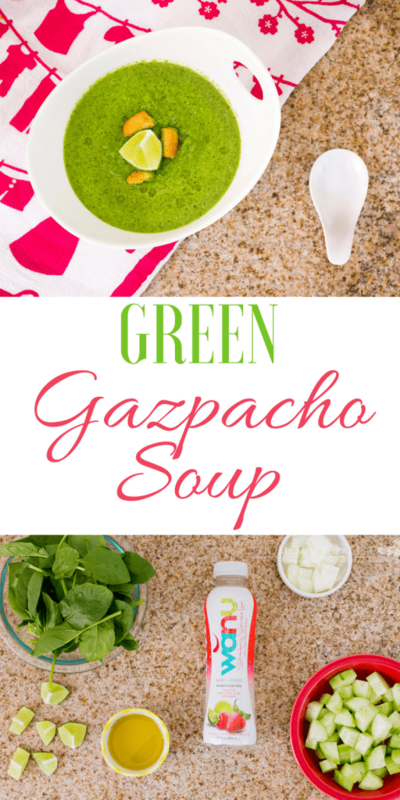 Do you want to print out this green gazpacho soup recipe to hang on your fridge or share with a friend? Here is a print-friendly version! Combine all ingredients, except lemon, in a blender. Blend until smooth. Refrigerate for one hour, then serve with lemon wedges. 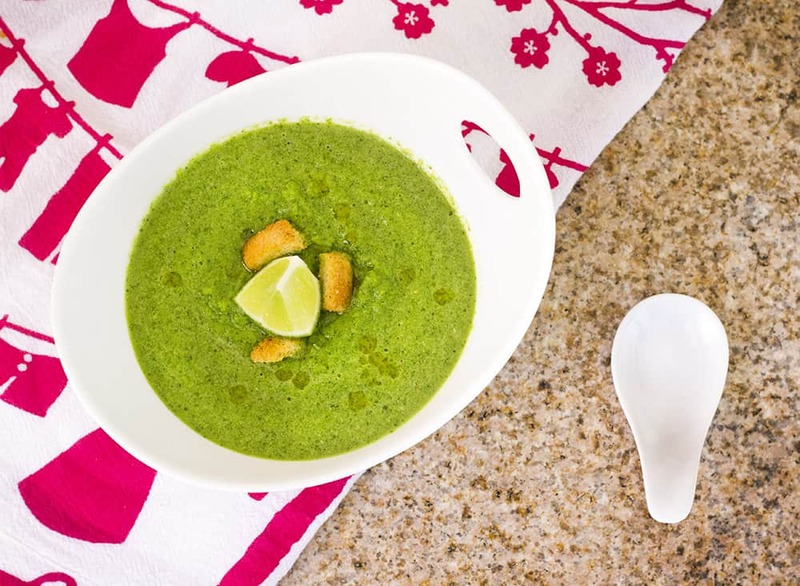 Want to try this green gazpacho soup recipe later? I’ve got you covered! Just click on the image below to pin it to your favorite recipe board. Be sure to grab your coupon to save $1.00 on the purchase of any two (2) 16oz bottles of wanu water! 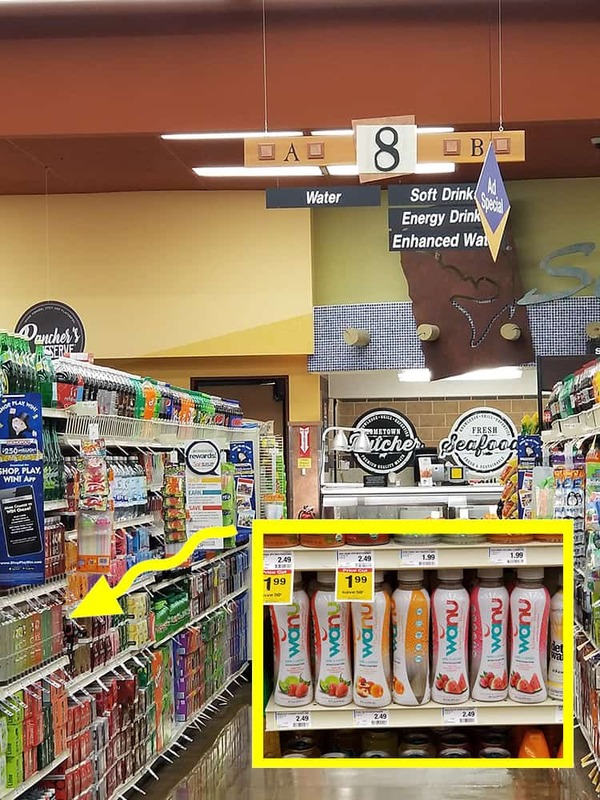 You can find wanu water in the water section at your local Albertsons. Offer expires 12/31/18. I can’t wait to try making this recipe. Thanks. It looks amazing! I’ve never heard of Wanu water. I’ll check it out! Thanks. Wanu water is a new addition to my kitchen. The ingredients to this recipe is going on the shopping list. I really want to try the Wanu water. Also the soup looks very tasty too. I drink green smoothies all the time. I am not sure I could eat something that green though – totally a mental block type of issue for sure. Easy quieezy recipe. I love how simple the ingredients and the steps are! Very nutritious too! I also prefer goals than resolutions, at least I know where I am in my goals. 😉 By the way, thanks for sharing this recipe, I have pinned it in one of my Pinterest boards to find this recipe again. I would like to try that strawberry drink. Your son’s eyes says it all. So cute. 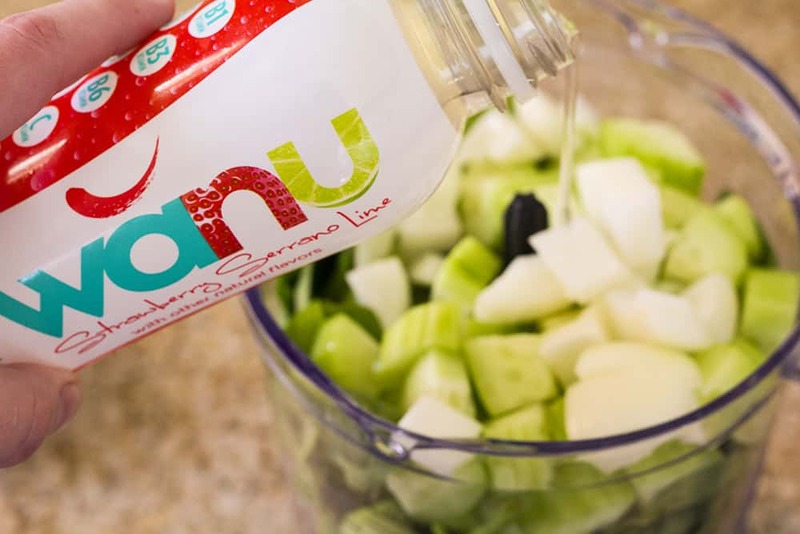 I really need to find this Wanu water in our store! I love Gazpacho but have never had green Gazpacho before! I will absolutely try this recipe! I haven’t had gazpacho in ages! I can’t even remember if I like it or not! But I would be happy to try this recipe! Oh now this sounds like an interesting recipe. I have to admit I am all for a taste of summer as well! Bring it on!